Shopping for a stroller is not the easiest thing to do, we remember scouring the internet and taking multiple trips down to the local baby superstore trying to compare and contrast the best strollers. Really we didn’t have any idea which one would be better. The problem is that with such a big purchase it is hard to know what you are going to want to use it for in 3-4 years when you still need a stroller. Your needs will be different than they are with a newborn. The best stroller for you will fit into your current lifestyle and unless you want to buy and sell strollers it will be nice if that same stroller fits your lifestyle once your baby is older. Our focus at MyTinyTraveller.com is to help parents be mobile, to help parents bridge the gap between their free to go wherever they want lifestyle without babies and their new way of life with children. The center of this baby on the move culture is the stroller. Since everybody is looking for something different you first need to decide what your priorities are. Are you just looking to take a stroll around the block or use your stroller in walking around the mall? Or, are you looking to bring your baby along with you on a run or are you taking them to Paris with you for a week? We will go through the obvious path of priorities for any parent. The first concern of any parent should be the safety of their child. Luckily, there are safety standards set that are pretty ridged. It will be hard to find a stroller on the market that does not meet the general safety standards for strollers, that is just looking for a lawsuit. Some things to consider to add to the safety of the stroller is side impact protection, a 5 point harness with a good buckle, and we also really like the ability to hold a purse or backpack somewhere without tipping over. Side impact protection is often found in car seats and sometimes in the strollers themselves, basically, this is just padding along the sides. A 5 point harness is a must but how good is a belt if your child can easily get out of it. A good buckle will be easy for you to do but hard for even a 4 year old to do. 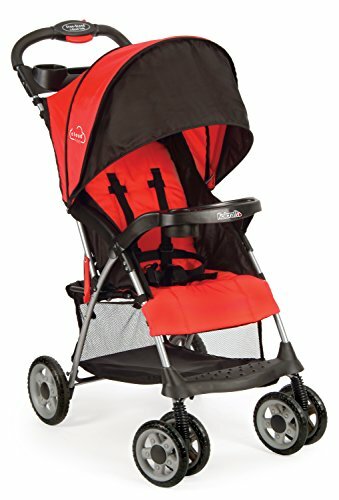 It seems that all strollers fold up but some of the companies have the folding mechanisms down way better than others. The stroller needs to fit in your car, preferably in your trunk. This is no problem for the umbrella type strollers but for a double jogging stroller to fit in the trunk of a Honda it better fold up really well. If you want to do more than just drive around town like take a flight with your stroller, there are some stroller brands that really focus on the ability to fit in an overhead carry-on compartment and are specifically designed for the traveling parents in mind. All this to say you need to know how big of a space you have to fit the stroller into and then keep the folded measurements of the stroller in mind. As a side note, some brands fold lock works well and holds the stroller shut while some others are almost impossible to get to latch. The second half of portability is weight. Weight in a stroller can be good and bad. The good of a slightly heavy stroller is safety and how many things you can hang off of it. If you are pretty strong and you know you are not going to be carrying your stroller folded for very long a slightly heavier stroller isn’t all that bad. On the flip side, if you know that you will be out and about and sometimes carrying the stroller than you really want to keep your eyes out for a lighter model. Now that the basics are taken care of you really want a stroller that is comfortable for your little ones to ride in and is comfortable for you to push. As far as your passengers are concerned things to look for are a little extra padding, reclining seatbacks, optional food trays, pillows/headrests, large sun shades, and wheel suspension. It is obvious that these additions can take your kid’s stroller experience from that of a rough ride to rolling in style and smooth comfort even over bumpy trails. For you, the parent things that can greatly increase your amount of comfort first off are the ease that everything works. Is it easy to fold? Is it easy to put the break on? Is it easy to pick up? Next, the thing that we look at is the height of the handlebar. Some strollers are just way too short and if you want to push them you need to be leaned over and you end up almost kicking the back of the stroller with every step. Make sure that the stroller that you choose is at a good height for you, you will be pushing it a lot. Other things to consider are a try for you to keep a drink, a large storage compartment that is easy to access, and large wheels that make pushing the stroller easier. Part of comfort but almost its own section is maneuverability. It is amazing the difference that you feel when you push a high-end stroller with great maneuverability vs some other models that feel like you are pushing through molasses. The types and size of wheels are very important for maneuverability, larger wheels will not get caught in cracks in the road as easily and will roll over rocks without a problem while a small wheel can get locked up by just a small rock in the right place. As far as types of wheels there are hard wheels and soft wheels, hard wheels give less friction but the ride is bumpier. Soft wheels are usually air-filled but sometimes they are types of foam rubber. The other main point for maneuverability is how many wheels the stroller has. Three-wheeled strollers are much more maneuverable since they have a smaller turning radius but they are not quite as stable unless the back two wheels are well spread. I hope that this quick rundown of things to look for in the best strollers helped, take a look through our different stroller articles to decided the stroller that is best for you. As you can see there are all different categories of strollers so we felt it best to separate them instead of just doing a single best stroller article. Enjoy reading. If you are looking for a stroller that will grow with your family then a convertible stroller is the way to go. Convertible strollers are strollers thttp://mytinytraveller.com/best-convertible-stroller/hat you can easily attach and detach new seats to and change around the configuration to best suit your family. You will not be doing much off-road strolling or running in a standard convertible stroller but for around town, they are hard to beat and can save your family money since you will only have to buy attachments instead of a whole new stroller. The Uppababy Vista Stroller is a great 3-in-1 option, giving you the option of a pram, an infant stroller, and a regular toddler stroller all at the same time. The pram option uses a bassinet, which attaches to the stroller, allowing you to use this stroller right from the time your baby is born. The bassinet can also be used on its own as a bed when needed. 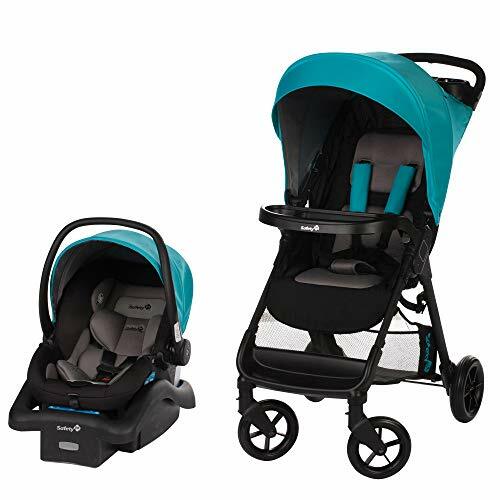 It includes great features, like the front or rear-facing toddler seat, the included rain and insect shield, a large storage basket, front and rear suspension, and oversized foam-filled rubber wheels for excellent grip and a smooth ride. This model is also easy to use, with a one-hand fold and seat-reclining capabilities. If you have more than one kid within a few years you will need a double stroller. Double strollers allow you to go on long walks that your toddler can’t do while carrying an infant in a car seat or a smaller child. We know moms that are still sticking their 7 and 4-year-olds in double strollers for walks to school or trips to theme parks. Even your older ones will run out of energy eventually and will be glad that mom brought a double. Getting a good double stroller will help you conserve your energy when the little ones have run out of theirs. The Graco Ready2Grow Click Connect stroller is one of the most versatile on the market, giving you room for two children from birth to youth. It can handle two infant car seats at the same time, both rear-facing for more interaction with the little ones. There is also a multi-position front seat, which reclines for increased comfort. The back seat is rear-facing, plus is removable to give your older children access to a bench seat and a standing platform. There are also great features, like parent and child trays, canopies, a large storage basket, and comes in a variety of stylish colors. Umbrella strollers are named after the way that an umbrella folds up in all directions to create just a stick. 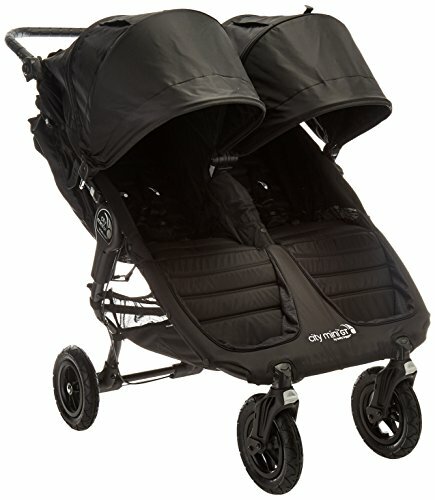 All of the other strollers that we talk about here only fold end over end instead of in from both sides. Umbrella strollers can be very very light and are great to have in all car trunks so you never leave home without a stroller. They work great for short trips to the store and anywhere else you forgot to bring your larger stroller. The best stroller is the one that you have when you need it and many many times for moms and dads it is the umbrella stroller that you almost forgot you had in the trunk that saved you. Just because an umbrella stroller is small, it doesn’t mean it needs to skimp on all the features. The Summer Infant 3DLite Convenience Stroller has a durable aluminum frame and a large seat with a 4-position recline and a 5-point safety harness to keep your child comfortable and secure. The front wheels are anti-shock and the rear ones lock to keep the stroller in place. The canopy is adjustable and includes a flip-out sun visor, plus is removable for cloudy days or when using it indoors. There is also a large storage basket and a rear storage pocket behind the seat. The whole stroller weighs only 13 pounds, folds easily with a lock to keep it closed, and has a carry strap for added convenience. Jogging strollers are not just for jogging anymore… We see more moms using jogging strollers as their everyday strollers these days. 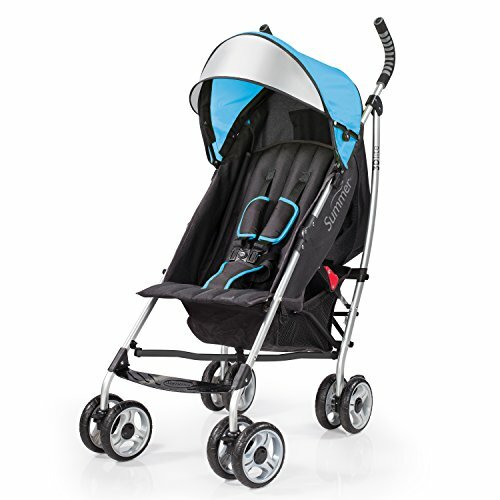 Jogging strollers have quite a bit going for them, they usually have 3 wheels so they are very maneuverable, they buckling system is not easy for little ones to undo, and they have large tires so they take bumps in the road easily. 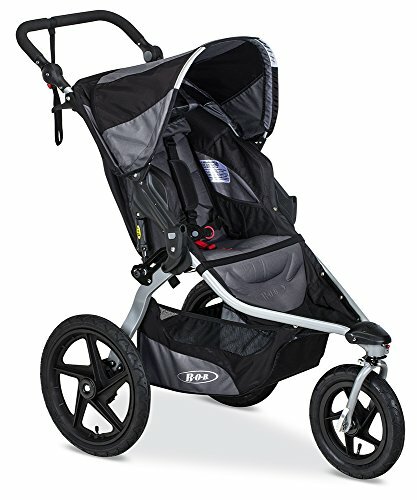 Good jogging strollers might be the best strollers overall for usability. If you plan on really using the stroller for jogging you need to take a look at our list since many of the so-called jogging strollers look the part but do not perform very well. A common complaint is that even though the front wheel locks in place at any real speed it shakes all over the place. There are dedicated jogging strollers that have a fixed front wheel so they are in most situation superior in jogging performance but they lack everyday usability. Since the wheels of a jogging stroller are their most important feature, the Bob Revolution Flex Single Stroller has put a lot of work into theirs. These strollers have a pivoting front wheel that increases maneuverability on turns, but locks in place for straight paths. Wide rear wheels add stability on all types of surfaces, plus are lockable when you stop for a rest. The unique suspension also keeps your baby more comfortable with less jostling. Other features include the durable aluminum frame, the two-step folding system, a large basket, and multiple storage pockets. The canopy is adjustable, with a peek-a-boo window so you can keep an eye on your baby at all times. A baby stroller in most cases is one that you can connect to a car seat. Our focus on baby strollers is very similar to travel systems except in this category we will also consider folding frame strollers that only take a car seat and also strollers that claim to be able to take an infant without the use of a car seat. It is hard to decide what you want to do for your newborn and infants, you want the best for them but you do not want to have to spend money twice. We analyze the options so you can make an informed decision. Something to always consider is that if you find that you want a separate stroller for when your kids and super small then you can always sell it used to recoup some of the cost, it will be lightly used and another mom can use it. The Graco SnugRider Elite Frame Stroller works with any of the Graco infant strollers on the market. They click in place, creating a handy travel system you can use anywhere. It is made of lightweight aluminum, so it will be easy to take with you. There is an all-wheel suspension to give your baby a smooth ride and front swivel wheels for increased maneuverability. The handle has an adjustable height, plus includes a parent tray with two cup holders. It also includes a large storage basket with a zippered security pocket. One-hand folding with an auto-lock makes it easy to collapse and store the stroller when you’re done with it. With your Tiny Traveller, you want to go all over the place. All around town and maybe all around the world. Since a stroller is your main form of transportation you need a lightweight stroller. Lightweight strollers come in many different forms. If you have a small baby then your options are car seat frame strollers or lightweight stroller with adapters. If your little one does not need a car seat then your options also open up to umbrella strollers. We will also go the extra mile and tell you what we think the best lightweight jogging stroller is. The Kolcraft Plus Lightweight Stroller is only 11.8 pounds, making it one of the lightest around. It doesn’t skimp on the features, either. It has a reclining seat, complete with a 5-point safety harness for your little one. A large basket underneath gives you plenty of storage space. There is a parent tray with two cup holders and a small storage spot for a snack, keys, or a phone. The removable child tray also has space for snacks, plus fits a water bottle or a juice box. A large canopy keeps the sun off your child but has a peek-a-boo window for you to keep an eye on them. It also has a one-hand fold for added convenience. A travel system stroller is just a stroller, car seat and car seat base that work together seamlessly. The term travel system stroller usually refers to a package that all comes from one company. In addition to the all-in-one packages, we decided to also include strollers with their car seat adapters. A complete travel system is a necessity for the baby on the go for the simple reason that it is very very important to keep a sleeping baby sleep. A well-designed system will give you more freedom while allowing you to transfer your baby from car seat to car to stroller without missing a beat. The Graco Modes Travel System has everything you need for traveling with your baby. It starts with the infant car seat and base. The infant seat can be placed on the stroller, either in front-facing or rear-facing positions. When the baby outgrows the infant seat, attach the toddler seat to the stroller and put your child directly in there. The stroller seat has 4-position recline and a 3-position leg rest, giving you multiple seating options all in one package. There are also a number of great features, like 5-point safety harnesses, a large storage basket, great canopies, parent and child trays, lockable front swivel wheels, and a one-hand standing fold. With two kids you still want to stay mobile. You need to get a double stroller travel system or and double stroller with a quality car seat attachment. 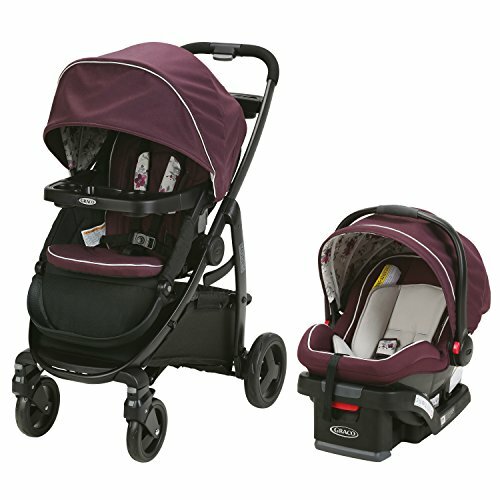 Double strollers come in tandem which means front and back or in side by side options. 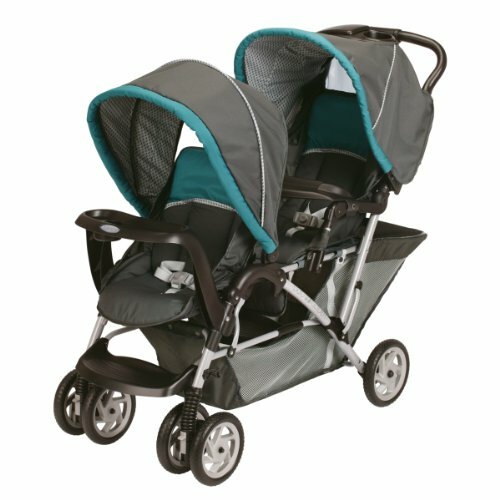 The Graco DuoGlider Classic Connect Double Stroller holds two kids at the same time, from babies to toddlers. It has room for 2 SnugRide Click Connect infant car seats, which lock in place with no adapters needed. There are also two stroller seats, perfect for bigger kids who’ve outgrown the baby seats. You can even use one of each if needed for children of different ages. Each tandem stroller seat has its own canopy, snack tray, and footrest, plus both fully recline if a nap is needed. 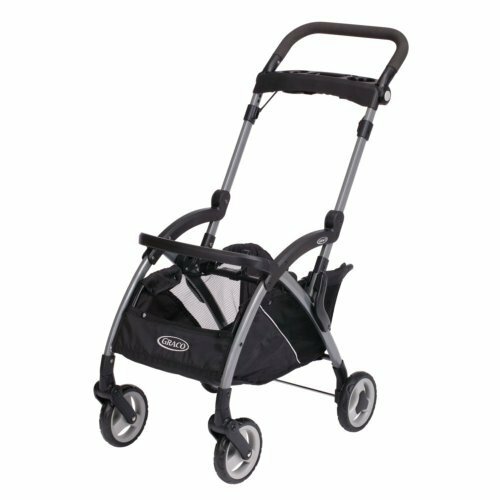 Front locking wheels, a parent tray, and a drop-down storage basket are also included, all for a great low price. We mention our favorite jogging stroller travel systems in our main travel systems article but we wanted to put a little extra emphasis on the top jogging travel systems. If this is what you are looking for you will enjoy the article. 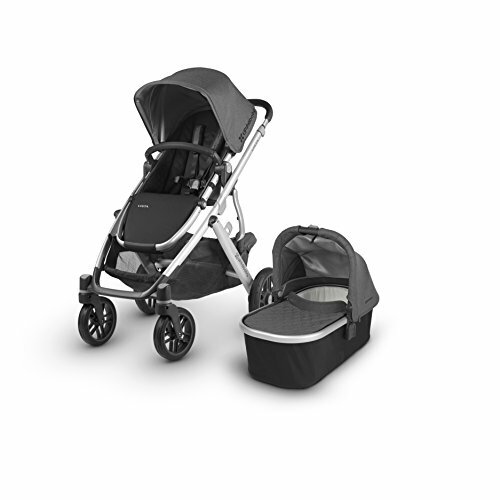 The Baby Trend Expedition LX Travel System has everything you need to take your kids on the road or for a run. It includes the Flex Lock 30 infant car seat, which accommodates babies up to 30 pounds and 30 inches. This seat has a 5-point safety harness, energy absorbing foam for side impact protection, and a 4-position height adjustable base. 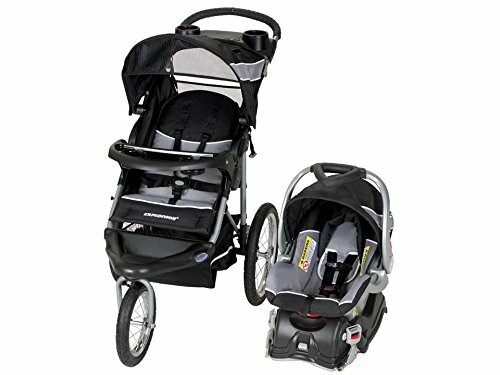 The Expedition LX Jogging stroller has all-terrain bicycle tires, with a front swivel tire that locks in place when running, plus a quick release for storage. It also features a 5-point harness, a large adjustable canopy with a peek-a-boo window, a big storage basket, a wide padded push handle, and trays for the child and parent. Some travel systems focus on being lightweight and mobile, in our top travel system article we mention or favorite lightweight travel system but there are other options, check it out. The Disney Amble Quad Travel System is one of the lightest sets around, weighing just under 24 pounds for the combined car seat and base. It has 3 adorable patterns, featuring Mickey or Minnie Mouse. 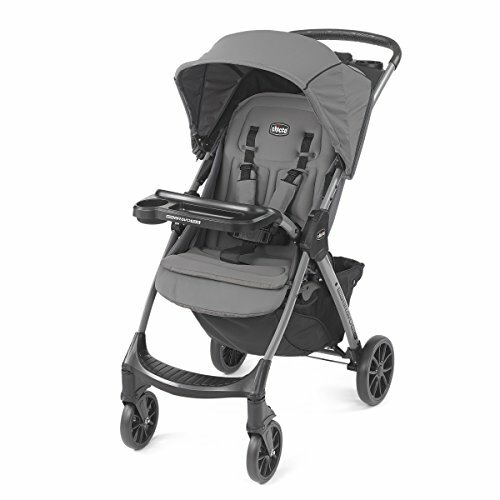 It also includes the safety features and extras you want on a great travel system. This includes 5-point harnesses on both pieces, a QuickClick system for easy attachment, and one-hand folding with a handle for lifting and carrying it. There is also a big storage area and parent and child trays for all your gear, snacks, and drinks. The car seat and stroller are also padded to give your little one a more comfortable ride. We really like staying gender neutral with strollers but you might really want to go boy all of the way. You can get strollers with different characters on them or in obvious boy colors or patterns. Take a look at our favorite boy themed strollers. 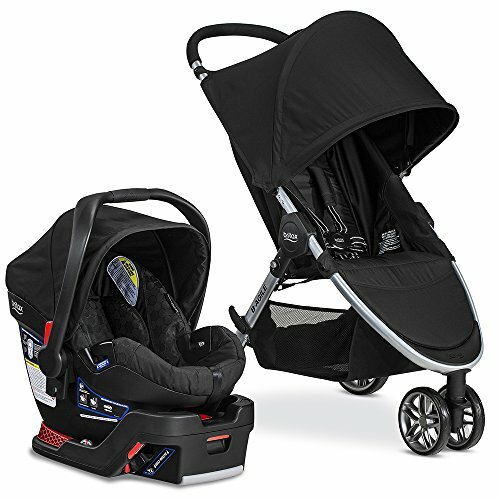 The Britax B Agile & B Safe system has a simple design, with black circle patterns on the inside of the car seat and basic black on the stroller. This set puts safety first, including a steel frame, a 5-point harness, and side impact protection on the car seat and adding in an impact absorbing base. The B Agile stroller has a huge canopy to keep your little boy safe from harmful UV rays, a quick one-hand fold, and a 3-wheel design for easy maneuvering. It also has a lightweight aluminum frame and a decent storage basket for a diaper bag or purse. The Click and Go System lets you attach the two pieces quickly and easily. Just like the boy strollers we prefer gender neutral strollers since they are easier to reuse and resale. 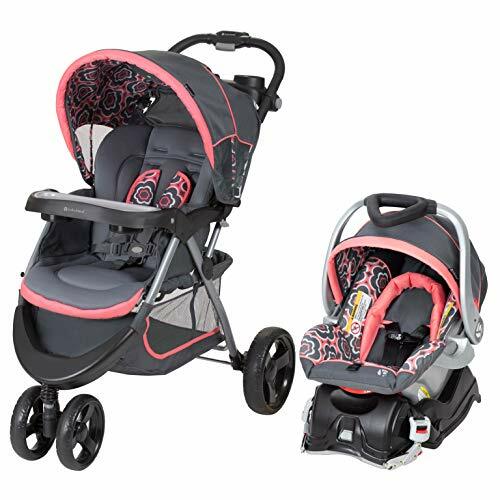 If you want a stroller that just screams this is my girls ride then come check out our selections for top travel systems for girls. The adorable Coral Floral pattern on the Baby Trend Nexton Travel System is perfect for any baby girl. The big pink and white flowers adorn the sides of the car seat and both canopies, plus the padding on the stroller straps. But this set is more than its design. The Flex-Lock car seat has a large head support, a 3-tiered expandable canopy, a 5-point harness, and a base with 4 adjustable height levels. The cute stroller has a padded reclining seat, 3 wheels with rear brakes, a parent tray and removable child tray, an adjustable handle, and an easy one-hand fold for added convenience. These are the best quality budget priced travel systems on the market. Strollers have a huge price range these are the stroller for the families sticking to a budget, they are all still quality rides they just lack a few features. 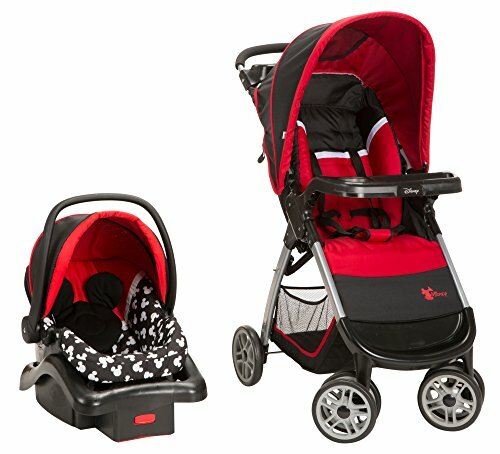 If you’re on a budget, but still need decent baby gear, you can’t go wrong with the Safety 1st Smooth Ride Travel System. The price tag is nice and low, yet it doesn’t sacrifice the features you need. The stroller has a great big canopy with a peek-a-boo window, a decent-sized basket, padded harnesses, and trays for both the pusher and the rider. The wheels are also agile, giving you easy maneuvering, plus it folds down quickly and easily. 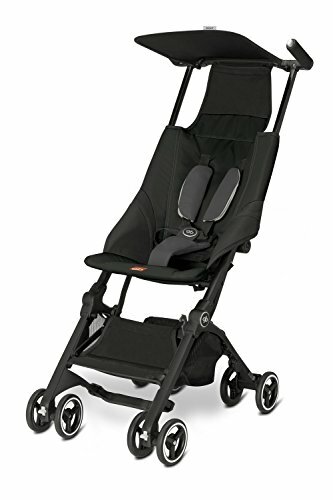 The car seat attaches to the stroller or base with a simple QuickClick connection. It includes side impact protection, a 5-point harness with 4 height adjustments, and some extra head and body support for newborns. Congratulations! Twins are a blessing. You really need to have a good stroller so you can claim your freedom with these two moving all over the place. It would be nice if you could have one stroller that would take you from twin babies to twin toddlers. We will discuss your options as even many of the high-quality double strollers do not have the ability to take two car seats. Some other things to consider is if you want a tandem type stroller with the two little ones front and back or if you want a side by side double stroller. We compare the top options and let you know our favorites. Twins may be double the joy, but they are also double the work and double the stuff. The Baby Jogger City Mini GT Double Stroller has everything you need for transporting your new babies. This stroller has all terrain tires with front wheel suspension. There are padded seats, which recline to near-flat positions, so your babies can nap comfortably. It also has independent, adjustable canopies with peek-a-boo windows, an adjustable handlebar, two storage baskets, and pockets behind the seats for all your gear. This stroller can hold two children up to 100 lbs combined, plus is compatible with any type of car seat when using the car seat adapter, which can be purchased separately. Different than a travel system stroller, travel strollers are specially designed to keep you on the move anywhere and everywhere. Many of them have made special size considerations so they fit easily onto airplanes as carry-on luggage or they are particularly light. Since our goal on this site is to help you find the best mobile baby products on the market this is the pinnacle of mobility. Hopefully, we will see you and your baby in Paris. Guinness World Records gave the Pockit Lightweight Stroller it’s World’s Smallest Folding Stroller title in 2014, so you know it is compact enough to fit into an overhead bin or the trunk of your car for travel. It is also lightweight at only 9.5 pounds. This stroller is still sturdy, though, with a durable aluminum frame that can withstand a lot of use. It holds children up to 55 pounds, plus 11 pounds of gear in the storage area under the seat. There is padding on the shoulder and crotch areas of the 5-point harness, plus a sliding back panel that allows you to adjust to fit the child’s torso length. 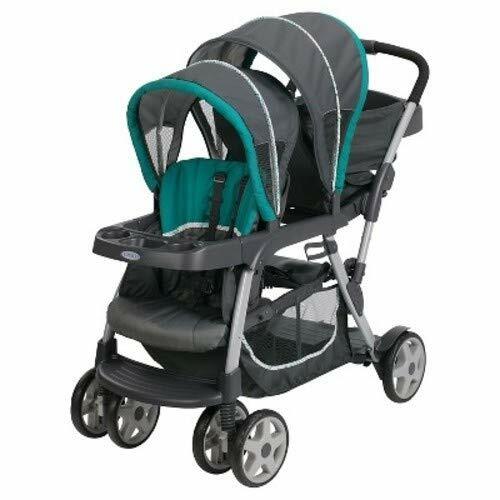 Other great features include the overhead canopy, padded handles, lockable front swivel wheels, and rear brakes. For the parent that loves the outdoors. All terrain strollers can take a beating and keep on going. Many times they have added features like suspension and large air-filled tires that allow you and your little ones to make it up Everest. Well, maybe not that all terrain but enough to claim your mobile freedom and go on those trails that you loved walking on before you had any kids. 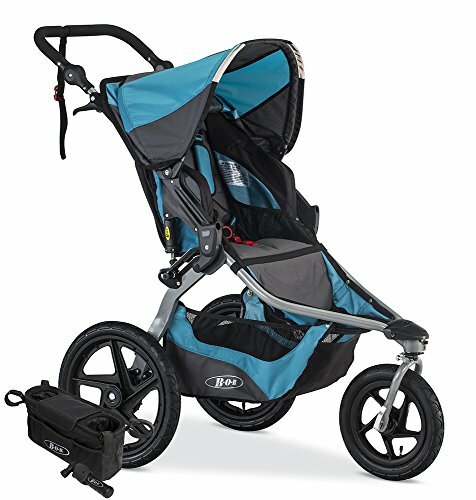 Take a look at our top choices for all terrain strollers and get out on the wide open trails. The Bob Revolution Flex is made for any type of terrain, with its huge air-filled tires on the high-impact polymer wheels that give your little one a smooth ride on any surface. There is also a state-of-the-art adjustable suspension system that keeps those bumps from jostling your little one. But this stroller is more than its wheels and suspension. It has an adjustable padded handle, a large storage basket, a large pocket behind the seat, a wrist tether, a padded 5-point handle, an adjustable canopy, and a reclining seat. It also folds easily with one-hand. This model can even become a travel system when paired with a Bob B Safe 35 infant car seat and an adapter. Toddlers need a lot of attention and some strollers help them be good while others help them act out. A good toddler stroller will have trays for food, a fool-proof harness that can’t be easily undone and it will be high enough so your growing kids will not hit their heads on it. We really like strollers that are easy for the kids to get in and out of also without requiring much climbing. There are a number of features on the Chicco Mini Bravo Plus Stroller that will keep your toddler comfortable and entertained while running errands or strolling along your favorite path. They have a detachable tray with a cup holder and a bit of storage space for some snacks and small toys. The seat has 3-position reclining, with a padded 5-point harness that keeps them in their seat. The canopy is quite large, with a mesh extender for a larger cover and some air flow. A large storage basket stores extra snacks, clothes, toys, and more. For you, there is a parent tray with 2 cup holders and zippered storage space, a one-hand fold with a carry handle, and toe-tap locking rear brakes. Thank you for reading through and perusing our articles on the best strollers. Really the key is that you need to know what you plan on doing with the stroller before you buy it. If you liked any of the stroller recommendations that we made and found our advice helpful, please click through one of the links and purchase a stroller through Amazon. As long as you purchase through our link we are paid a small commission on the sale without any increased cost to you. This is how we keep this website up and running with the best information on the internet for tiny travellers. Thanks for reading MyTinyTraveller.